Metro Pictures opens an exhibition of photographs, films, and installation works by the renowned Dutch / Los Angeles artist Bas Jan Ader on Tuesday, June 21. Included are complete sets of the original photographs Ader made for his book “Fall I and II,” which were subsequently shown in his first exhibitions. Exhibited for the first time are photographic studies for other important works made in the early 1970s. Ader’s well-documented story is so compelling that his poignant art is fused into the narrative of his history. In 1963 Ader moved from Amsterdam to Los Angeles where he was associated with a group of artists whose work would define an important strain of conceptual art distinct to the West Coast. There he produced a small but extraordinarily affecting body of artworks prior to 1975, when he disappeared at sea while sailing the Atlantic alone as the second part of his trilogy “In Search of the Miraculous.” The first part, included in the exhibition, comprises 18 black-and-white photographs of the artist walking through Los Angeles at night. The third part was to be an exhibition at the Groeningen Museum after arriving in Europe. Bas Jan Ader’s art had the same effect, beauty and pathos when it was exhibited more than 40 years ago, without knowing his family history or the dramatic and mysterious circumstances surrounding his disappearance. At the time Ader was working there was little awareness of the parallel between his art and his haunting family history. Later his work was revealed to be unexpectedly autobiographical, and sometimes abstractly illustrative of the factual and emotional narrative that governed his life. In the dual slide projection “Untitled (Swedish Fall)” Ader stands straight and thin amid a forest of similarly tall trees in one image, and in the second he lies collapsed on the ground in the same wooded scene with fallen trees lying around him. When Ader was 2 years old his father, a celebrated member of the resistance during Nazi occupation, was captured, imprisoned and later taken to the woods where he and six other prisoners were shot, and their bodies left on the ground as an example to the townspeople. Bas Jan Ader’s work was first shown in the United States in a three-person exhibition organized by Metro Pictures’ Helene Winer at the Pomona College of Art Museum in 1972. München Kunstverein, Munich organized a major exhibition in 2000 that travelled to Bonner Kunstverein, Bonn and Kunstverein Braunschweig in Germany. Additionally, his work has been the subject of numerous one-person exhibitions that include Camden Arts Center, London; Museo Tamayo, Mexico City; Museum Boijmans van Beuningen, Rotterdam; Portikus, Frankfurt and Kunsthalle Basel. The films have been screened in festivals and exhibitions in recent years. A comprehensive volume covering Ader’s life and work, titled “Death is Elsewhere” by art historian Alexander Dumbadze was published by the University of Chicago Press in 2013. 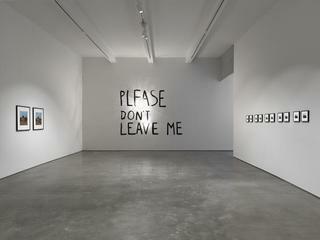 Metro Pictures would like to thank The Estate of Bas Jan Ader, Mary Sue Ader Andersen and Meliksetian | Briggs, Los Angeles.